Sunday, February 17, 2019 3 to 4:30 p.m.
Sunday, April 29, 2018 – 3 to 4:30 p.m.
Rafael Perea de la Cabada is a multi-disciplinary artist whose work is steeped in the artist’s rich cultural heritage. The artist describes himself as a visual poet, offering a powerful dialog that resonates with the plight of humanity. His intuitive approach draws from his personal experience, incorporating deep narratives layered in symbolism. Concepts range the gamut of human experience, from humorous and playful to social and political discourse. Perea states, “Art for me has a transformative power, a delicate volatility that triggers our craving for a deeper perceptual level. I find art making an endless mystery, a choice and a calling.” Perea received a degree from the National School of Painting, Sculpture and Printmaking in his native Mexico City before earning his M.F.A. from UCSB. 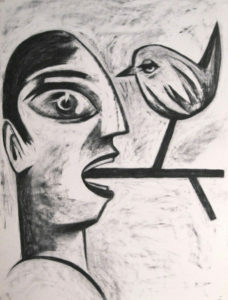 His broad range of expression includes painting, printmaking, mixed media, installation, public art and sculpture. With a foundation in Mexican modernism, he pursues his work as “a seamless merging of the mental/emotional intent, [where] the physical process and craft converge.” He shares his vast knowledge as a professor of drawing and painting at Santa Barbara City College. His work has been exhibited nationally and internationally and is included in numerous prestigious public and private collections. Admission is $15 for general public; $10 for seniors. FREE to Focus on the Masters Members. RSVP required at www.FocusOnTheMasters.com or 805.653.2501. The Artist Spotlight and panel discussion is open to students attending as a class assignment free of charge. FOTM is happy to assist with tracking attendance and sign-in sheets. Reservations required. The public is welcome to join the artist for a celebratory fundraising dinner at VITA Art Center, located just steps from the museum, immediately following the program. Paid reservations are required prior to February 12. The AfterGLOW is hosted by the Old Broad’s Catering Company & Luther Tolo. $30 FOTM members, $40 Non-members. Maps will be given to paid guests at the interview.